Brush a large bowl with oil and place the dough inside, turning to coat. Cover and let rise in a warm place (I turn on my oven and set it on top) until it’s double in size – about 1 hour. Once doubled, punch down the dough and place it on your counter, using a little more flour if needed to prevent it from sticking. Divide the dough into 12 pieces (I actually got 15) that are 2.5-3 ounces each. Using your kitchen scale here is priceless! Rolls the dough into balls, then places on an oiled baking sheet, cover and let rise for 30 minutes. At this time, grate your cheese and place it in a large bowl. After 30 minutes, fill a large pot with water and add brown sugar, letting it come to a boil. While the water is heating up, take each round of dough and poke a hole straight through the middle, twirling it gently on your finger to create the bagel “look.” Place back down on the baking sheet and let rest for 10-15 minutes, while the water comes to a rolling boil. Preheat oven to 400 degrees. If needed/desired, grease another baking sheet. I did this as I found it was easier to place the bagels on. Once boiling, add 3-4 bagels at a time. Let cook for 2 minutes on one side, then using the end of a wooden spoon, flip the bagel and cook for another 30 seconds. 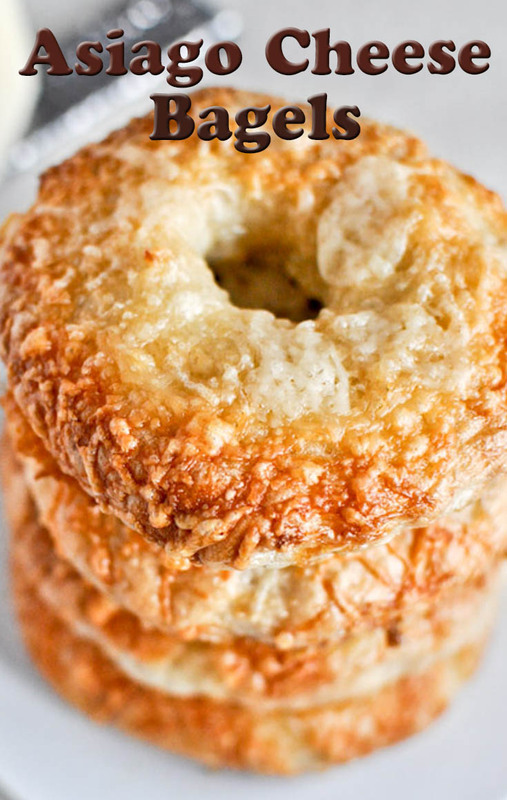 Remove bagels one at a time and place in the bowl of asiago cheese, turning to coat and lightly pressing to adhere. Transfer to the greased baking sheet for final baking and repeat. Once all the bagels (or as many that can fit on your sheet) are finished, place in the oven and bake for 28-35 minutes. I began checking mine after 20 minutes just to ensure that they cheese wasn’t burning. It never burnt, but it did get golden and delicious!